Here's a batch of monsters I'm making for myself, and for the store Minizabies in Rosemont. 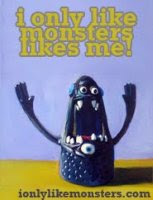 They contacted me last weekend and were interested in selling my monsters in their store, and I was very excited! I've been working hard these past few weeks, making stock for the upcoming craft fairs, as well as stocking Perfide and Tah-Dah! for Christmas. I hope this new store will love my dolls, as well as the customers! Here's some photos of the plush I made, not stuffed yet. Will look forward to seeing these guys stuffed! They look ever so promising as they are. Have just come across you on the Plush Toys and Ragdolls team site on Etsy and invite you to follow my blog at www.ColdhamCuddliescalling.blogspot.com, while I follow you! If you enjoy it, why not visit my shop too - it's www.coldhamcuddlies.etsy.com. Hope to see you there soon! Having just commented, realised that you were kind enough to advise me as to how to fix widgets on my blog. Most grateful, but have not had the time to devote to doing it - it's on the to-do list! Thanks again for your help though!